This is a highly enjoyable film. It couldn’t really fail as a nostalgic celebration of arguably the most successful sports team of all time. But it’s a good watch for all audiences – whether or not you remember the West Indies Test team of the 1970s and 1980s. 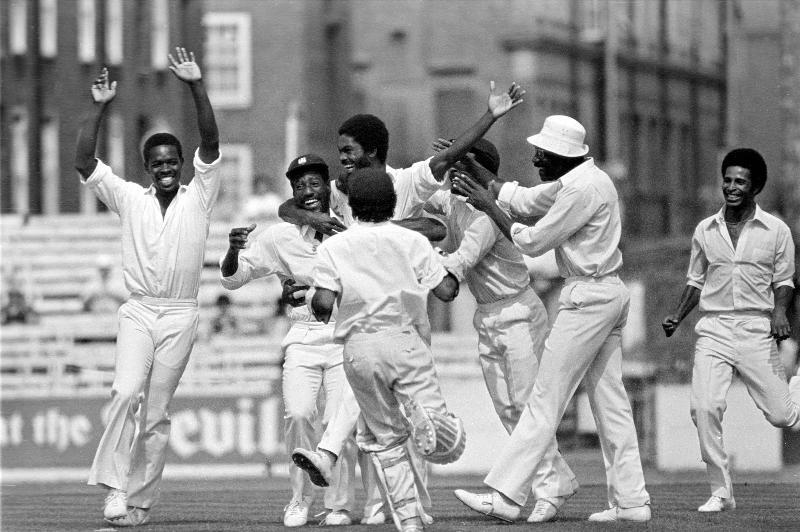 There is actually relatively little about cricket itself as a game, but a great deal about what it represented as a political and cultural force for Caribbean people in the period. The documentary covers the years between the humiliating test defeat of the West Indies in Australia in the winter of 1975-76 up until the 5-0 ‘Blackwash’ of England in the summer of 1984. This was the period in which Clive Lloyd led a team which was transformed from stereotypical ‘calypso cricketers’ into a honed squad of invincibles, in the process forging a symbol of a unified West Indian identity across the disparate countries of the Caribbean and bolstering the struggle against racism and colonialist hangovers. The events are carefully narrativised so that there is a conventional story arc. So, the success of the West Indies in the inaugural World Cup in London in 1975 is not included. They beat Australia twice in the one day competition and that wouldn’t have been a good starting point. Instead we get to see them pulverised by Dennis Lillee and Jeff Thompson. I’d forgotten this and it was quite a shock. Indian commentators have noted that the film also misrepresents the next series they played against India. But apart from these manipulations the story is told in a straightforward way using archive footage and talking heads. The latter are often photographed in a stylised way, in a studio or on location in the Caribbean. As well as the cricketers themselves, the ‘interviewees’ include the great Bunny Wailer and several highly entertaining supporters. Interspersed are performances from a mento band, reggae stars like Tapper Zukie, archive footage of Bob Marley and, my favourite, a song by Short Shirt, the Antiguan calypsonian in the most outrageous costume I’ve seen in a while – I can’t begin to describe the exact colour of his hat and shoes! The impact of these interviews/performances filmed in HD video and with pulsing graphics using the African colours of green, red and gold is all the greater because of their juxtaposition with the archive video footage on a big screen using digital projection. The strength of the film is its clear connection between pride in cricket and pride in African heritage, emphasised by the comments of Bunny Wailer. It’s always been a sensitive area to comment on the sporting prowess of Black athletes because of the danger of ‘reducing’ Black achievement to physique rather than an overall appreciation of skill and intelligence. The film avoids this, I think, by its careful linkage of the US models (Muhammad Ali, Tommie Smith’s Black Power salute at the Mexico Olympics etc.) with Clive Lloyd’s leadership and the fantastic individual stars of this great team. How could you not respond to the beauty, grace and power of Michael Holding (aka ‘Whispering Death’) surely the most aesthetically pleasing as well as the most lethal sight on a cricket pitch? What could top the sight of Viv Richards ducking bouncers and then sending the next ball to the boundary rope? The filmmakers have chosen the interviewees carefully so that we meet the most articulate and inspiring members of the team. Richards is a commanding presence, Andy Roberts is dry and deadly and Gordon Greenidge (who came to live in England aged 14) is the most dignified. Importantly there is one player whose presence in the documentary cuts through the possibility of too much simple idolatry on behalf of the audience. Colin Croft, one of the four bowling greats, accepted the money to join the rebel tour of South Africa in 1983 when the apartheid regime attempted to discredit the sporting boycott of South Africa. Croft survived the subsequent ban and shame to return as a respected commentator today – but many of the others on that tour had their careers, and indeed their lives, destroyed by the critical backlash. This part of the story, in which West Indian cricketers who were paid very little in comparison with modern stars were tempted by a chance to lift themselves out of relative poverty, is matched by the story of the Kerry Packer circus – ‘World Series Cricket’ in the late 1970s which saw Clive Lloyd’s team at odds with its own administrators in a bid to get better pay and conditions. The two stories underline the politics of international cricket. The film was directed by Stevan Riley, a young British guy who has clearly impressed Viv Richards and Clive Lloyd and gained access to the right people. I hope the film gets seen in the Caribbean and persuades more young people to get interested in cricket so that the Test team can be rejuvenated. It’s great too to hear all the music again and it must be time for more films from the region. Go and see this film or get hold of the DVD – it’s pure joy. I’m off to dig out some Linton Kwesi Johnson whose dub poetry is used in one clip. This entry was posted in British Cinema, Documentary, Politics on film and tagged Caribbean, cricket, sports film, West Indies. Bookmark the permalink.